Ilan Galkoff was aged two when his teacher noticed the youngster might just have the makings of a West End star. After singing a pop song, from beginning to end, the talented tot was taken around all the other groups at Gilah nursery in Borehamwood, where he flawlessly performed again. “Apparently I loved an audience!” laughs Ilan, now 13, who has just landed the lead role in a stage adaptation of Sue Townsend’s The Secret Diary of Adrian Mole The Musical. The show opens tomorrow at the Menier Chocolate Factory and runs until 9 September. By something of a fortuitous coincidence, Ilan was precisely 13 ¾ years old on the day of his audition for the show, which is based on the first two books in the bestselling series that have sold more than 20 million copies worldwide. The ups and downs of Adrian’s adolescent life are laid bare in all their 1980s glory, from his dysfunctional parents to school bully Barry Kent, his lost love Pandora and, of course, the unruly pimple on his chin that seems to grow ever bigger. 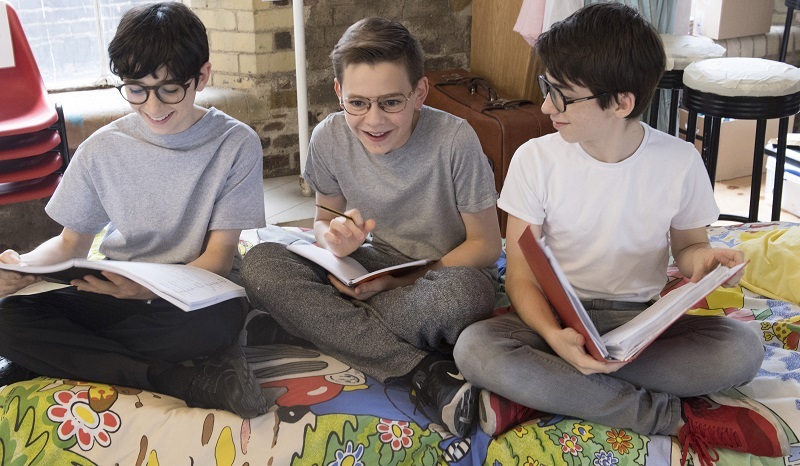 Like his co-stars Samuel Menhinick, 12 and Ben Lewis, 13, who share the title role, Ilan was just a glint in his parents’ eyes when Townsend first put pen to paper, but he feels the premise of the humorous tale is just as relevant today. The former pupil of Hertsmere Jewish Primary School, in Radlett, tells me: “Although life is very different now for a 13- ¾-year-old to what it was when the book was written back in the 1980s, there are obviously many challenges that teenagers today still face. “My character has a complex life, with parents who are separated and at the same time struggling with problems of his own, both in and out of school. His latest turn on the stage, which he describes as “my most challenging so far”, comes on the back of a CV filled with high-profile roles, including as Gavroche in Les Miserables and Nigel in Matilda. Acting and singing are his passion, as is dancing, with the latter skill attributed to his mum Suzanne getting Ilan involved in ballet at the age of three. He recalls: “All the mums [at HJPS nursery] got together and decided the boys could do football one morning and all the girls would make up a ballet class. My mum said she knew I wouldn’t like football, but I did like dancing, so she sent me to the ballet class with all the girls in pretty pink tutus! “Thank goodness I was dressed in navy joggers – and I loved the dancing. At the age of eight, he was signed up by the Sylvia Young Agency and was cast for the UK tour of Oliver!, opening the way for the West End and performances at the Royal Opera House. He’s even had the opportunity to voice a character for the animated Disney cartoon, Sofia The First. 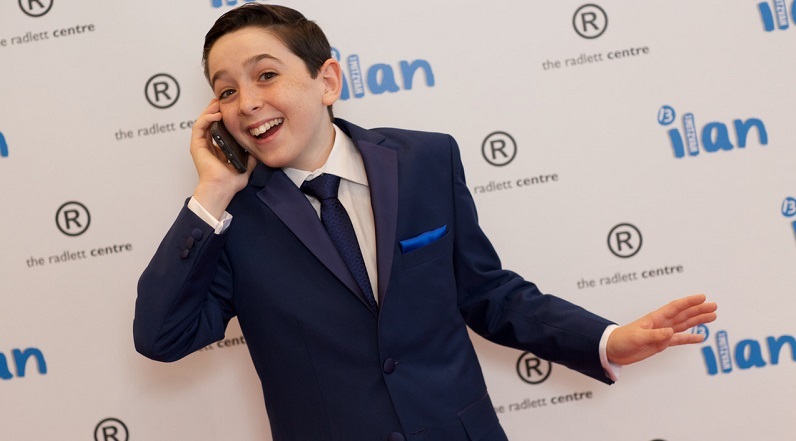 When he’s not busy auditioning, performing or touring, Ilan – who attends Borehamwood and Elstree United Synagogue with his family – is a regular boy soloist for the Shabbaton Choir. It all makes for a hectic schedule for the teenager, who recalls how he was given “the weekend off” from rehearsals for musical comedy Bumblescratch last year, so that he could celebrate his barmitzvah. He also had to juggle around performing in The Braille Legacy at Charing Cross Theatre when rehearsals began for Adrian Mole. Ilan, who is currently in Year 9 at the Sylvia Young Theatre School, explains: “Due to children’s licencing laws I was restricted on the number of hours that I could perform and rehearse, and of course I still had to spend time at school. Thankfully, proud parents Suzanne and Simon, and older siblings Rafi and Natalia, are on hand to give him all the support he needs. After discovering he had been cast for his latest role, it was his mum he turned to first for a big hug. The Secret Diary of Adrian Mole The Musical opens tomorrow at Menier Chocolate Factory, Southwark Street and runs until 9 September. Details: menierchocolatefactory.com or 020 7378 1713.